April 18, 2019 | Weather stations? Don’t you have a smartphone for that? April 18, 2019 | What does Wi-Fi stand for? April 17, 2019 | How close can your cell phone be to the booster’s indoor antenna? April 17, 2019 | What are the most important frequencies for a TV antenna? April 17, 2019 | Court TV Relaunch for Cord-Cutters! April 16, 2019 | DIRECTV customers: Don’t forget Cinemax! April 16, 2019 | Can you mount a satellite dish upside down? April 15, 2019 | When should you use a satellite tap instead of a splitter? April 15, 2019 | Have April showers taken a toll on your antenna? April 15, 2019 | How far away can your phone be from the tower? April 15, 2019 | Save Money While You Watch Sports! April 14, 2019 | Live TV is back. Are you in? 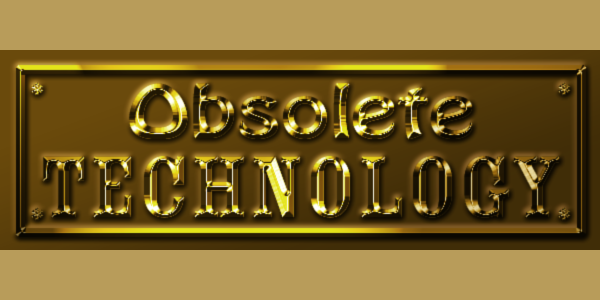 April 14, 2019 | How can you get better cell service in a dead zone? April 13, 2019 | Did your antenna survive the winter? Maybe you think you remember the floppy disk. “Hey,” you say, “That wasn’t that long ago.” You’re remembering the 3.5″ hard blue plastic disks that were common as late as 10 years ago. Everyone used them back then. This is the 8″ floppy disk shown being held by an average adult person. It was one disk, about the size of an iPad. It didn’t have a hard plastic shell so it was a lot easier to damage. It held an amazing 100 kilobytes (that’s [strike].001GB[/strike] a ridiculously small fraction of a gigabyte, and a typical flash drive is 8GB.) You would need 7,000 of these to hold one CD worth of music. When it first became available in 1971, it was the wonder of the age. Programmers in those days used gigantic storage platters that were 2 feet in diameter and 1 foot tall. This was a storage medium you could put in a briefcase and that was impressive. 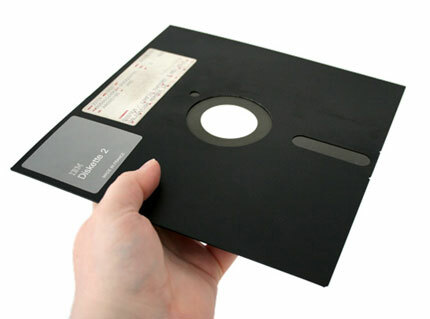 The floppy disk used the same magnetic technology used by tape readers but combined it with random-access technology like what was used in jukeboxes at the time. A robotic arm could position itself anywhere on the spinning surface of the disk, meaning that it didn’t take a lot of time to find the data you were looking for. It took about twenty minutes to read all the data from that floppy disk, which wasn’t as fast as other storage technologies of the day but it was easy to take from place to place. You could even bring it on an airplane! 8″ floppy disks gave way to the nearly identical-looking 5.25″ disks in the late 1970s and then to the 3.5″ disks you remember in the 1990s. Today floppy disks are gone from our lives, although they still show up as the “save” icon in your word processing program, mostly because no one has figured out a better icon for that yet. DISH finally doing something with its spectrum? Weather stations? Don’t you have a smartphone for that? What does Wi-Fi stand for? How close can your cell phone be to the booster’s indoor antenna? What are the most important frequencies for a TV antenna? Court TV Relaunch for Cord-Cutters! DIRECTV customers: Don’t forget Cinemax! Can you mount a satellite dish upside down? When should you use a satellite tap instead of a splitter? Have April showers taken a toll on your antenna? How far away can your phone be from the tower? Save Money While You Watch Sports! Live TV is back. Are you in? How can you get better cell service in a dead zone? Did your antenna survive the winter? Could a Genie client be any smaller? Should you put all your smart home products on a guest network? What is the best choice for wireless security? What can you do about bad cell service at a construction site? Can you use a DIRECTV power inserter to power an antenna? Podcast #320: Is baseball ready for 4K? Can your streaming box get infected with malware? SPECIAL OFFER For New DIRECTV Accounts! NICE AND EASY: Is it ok if an antenna sways in the wind? How high up should you mount your satellite dish? You just bought an RV with a satellite dish on it. Is it worth it to turn on? Wireless Genie Client problems? What can you do? Is DIRECTV’s 101 satellite going away? AT&T doesn’t sell microcells any more. So now what? What size power bank do you need? How Can I Install 17 Receivers? What’s the best value in pay TV? Why does everything look better on TV, and even better on a tablet? What is an SMA connector? Does your boat need multiple satellite domes?